The Orthotic and Prosthetic Alliance (O&P Alliance) is a coalition of the leading national organizations representing the orthotic and prosthetic profession. The five groups that comprise the O&P Alliance include: the American Academy of Orthotists and Prosthetists (AAOP); the American Board for Certification in Orthotics, Prosthetics & Pedorthics (ABC); the American Orthotic & Prosthetic Association (AOPA); the Board of Certification/Accreditation (BOC), and, the National Association for the Advancement of Orthotics and Prosthetics (NAAOP). Together, the O&P Alliance represents the scientific, research, professional, business, and quality improvement aspects of the O&P field. The O&P Alliance advocates for state and federal policy that improve the practice of O&P and quality of services provided to patients who require these health care services. Medicare should adopt appropriate quality standards for the provision of professional O&P care to ensure the quality of orthotic and prosthetic services for beneficiaries. Payment should only be made to those providers and suppliers who meet the quality standards. The O&P Alliance will support the development of qualifications for practitioners through O&P licensure at the state level and mandatory certification initiatives at the federal level. Quality and qualification standards should apply to both prosthetics and orthotics and should differentiate between levels of care (custom fabricated, custom fit high, custom fit low, and off-the-shelf). The O&P Alliance will oppose any legislative or regulatory scheme to permit Medicare "Direct Access" or self-referral by physical or occupational therapists because of the potential impact on the quality of comprehensive O&P care provided by therapists and because it is not in the interests of good patient care. Annual updates to the Medicare fee schedule. Exemptions from competitive bidding for all O&P care other than off-the-shelf orthotics. Separate and distinct treatment from durable medical equipment. Due process for changes to O&P coding and reimbursement conventions. Prompt and accurate payment from Medicare contractors. The Alliance will seek to maintain and promote the broadest coverage possible of professional O&P care under Medicare, Medicaid and private insurance. Improvements in Medicare O&P medical policies, including the promotion of new technologies. An exclusion of orthotics from Medicare's skilled nursing facility prospective payment system (SNF PPS). An extension of the useful lifetime rules from prosthetics only to both prosthetics and orthotics. State efforts to enact prosthetic and orthotic "parity" legislation and other favorable private insurance coverage efforts. The Alliance will actively support funding for the Academy's grant under the Department of Education through both the legislative and regulatory processes as part of a broader goal of enhancing funding for O&P education programs. The Alliance will actively support efforts to increase funding for research and to increase the profile of orthotics and prosthetics order to further develop reliable outcome measures, evidence of clinical efficacy, and advancements in O&P technology. 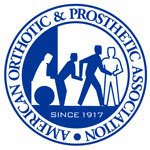 The Alliance will strive to increase awareness and support for the advancement of orthotics and prosthetics. Please click on one of the member organizations above for more information about the O&P profession.